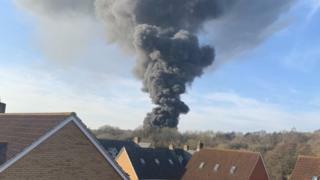 A fire on an industrial estate which could be seen for miles around in Bristol is thought to have been started deliberately. Crews tackled the blaze involving 300 containers at Bridge Road Industrial Estate in the Staple Hill area on Sunday. An Avon Fire and Rescue Service spokesman said nobody was hurt in the fire and the smoke was not toxic. He added the cause was "thought to be deliberate".